Responding to the needs of the Directorate of Health in Missan following the recent floods that hit the area, the World Health Organisation (WHO), with the generous support of donors, sent a large consignment of emergency kits and medical supplies to support the Directorate, 304 kilometres south east of Baghdad. WHO and Missan Directorate of Health staff witness firsthand the damage caused by floodingMissan was adversely affected by the floods which were caused by heavy rain and floods from the border with Islamic Republic of Iran. The flood water is covering a wide area of land, which has led to the migration of residents, damage to property, death of livestock and destruction of agricultural crops in many villages and marshlands. About 328 726 population are at risk. Cities and villages affected are: Ali al-Gharbi, al-Msharrah, Hay al-Mua’alemeen al-Jadeed, al-Salam, al-Faka, al-Btaira, al-Teeb, al-Adil, al-Maymouna, al-Uzair and al-Kahlaa. Areas seriously threatened are villages west of the Tigris River (Hor Al-Musandak) along Ali al-Gharbi, Ali al-Sharqi and Qamit. 545 families are displaced with another 2000 families threatened with displacement. The Government coordinated multisectoral efforts, supervised and supported relief operations, established 5 camps, and coordinated with Iraqi Army forces and civil defense to send helicopters to evacuate people trapped in flooded areas. With the situation quickly evolving, 101 families in some villages were evacuated to a camp in a neighbouring village. “In response to the crisis, the WHO country office in Iraq has been coordinating very closely with the Missan Directorate of Health. WHO kept high level coordination and collaboration with the Directorate of Health in Missan through medical operations and specialized services. Officials at Missan Directorate of Health stressed that the shipment would save lives in the governorate and could be used by mobile clinics offering emergency health care and services to affected people. They expressed appreciation to WHO and donors for their quick response and support. The consignment included supplementary module pharmaceutical kits, supplementary module equipment, renewable kits, trauma profile/emergency kits, medical supplies, and basic units (without a malaria component). Posted in baghdad, Basra, Citi, Citigroup, featured, Healthcare, Maysan, Missan, mn, World Health Organization (WHO). Iraq’s Ministy of Oil has awarded all four development projects, and two of the seven exploration blocks, that it offered in its fifth auction of oil licences. Only nine of the 26 companies originally pre-qualified took part in the auction, with majors such as Lukoil (Russia), ExxonMobil (US) and Total (France) not bidding. Abdul Mahdi al-Ameedi, director general of the Petroleum Contracts and Licensing Directorate (PCLD), told Reuters that the failure of five blocks to attract bids was due to a combination of factors, including the fact that some of them cover former battlefields, some are hard to access, and the one offshore plot needs more data. He said another round could be held for those five blocks. Posted in 5th round energy licences, Al Basra, Basra, Business, China, Crescent Petroleum, Diyala, ExxonMobil, Fao block, featured, Geo-Jade Petroleum, Gilabat-Qumar field, Hong Kong, Huwaiza oil field, Iraq Oil & Gas News, Jebel Sanam (Jabal Sanam), Khashim Ahmer-Injana, Khudher Al-Mai block, LUKoil, Maysan, Missan, Muthana, Naft Khana field, oil auction, PCLD, Petroleum Contracts and Licensing Directorate, Sindbad field, Sindebad field, Sindibad oil field, Total, United Arab Emirates (UAE), United Energy Group, Zurbatia field, Zurbatiya. Oil Minister Jabar Ali al-Luaibi [Allibi, Luiebi] has opened a gas treatment station at the Bazirgan field in Maysan [Missan] governorate. The celebration was also attended the members of the parliament, the deputies of the ministry, the directors general and the responsible officials of the ministry, the local government and the governorate. Mr. Al-Luiebi said that the gas investment is a real priority for the ministry of oil to stop wasting the oil wealth and to develop the gas industry in Iraq. Mr. Al-Luiebi said in his speech during the celebration that the gas treatment project is designed to process two million standard cubic meters of associated gas which means (71) MSCF/ day. The processed quantities of gas will be used to operate the (44) megawatts Maysan power station, in order to operate the production units and facilities in the oil fields and supply the surplus to the national power stations with an average of (60) megawatts. “We are standing today before and economic edifice and a new accomplishment achieved by the faithful sons of Iraq in general and Maysan in special, and this project is a part of the strategic significant plans of the ministry of oil to invest the associated gas and make use of it in the industry of liquid gas and condensed gas which has become a good economic source of outcome to the federal governmental budget, through the exportation which is being done since two years. In addition to the outcome of the crude oil exportation”. Mr. Al-Luiebi referred to the accomplishments of the ministry in the sectors of production, exportation and gas industry, which was made through the investment projects by cooperation with the national effort and the international specialized companies. In “dear Maysan” there was many accomplishments, such as the elevation of the oil production to about (480) thousand barrels/ day which can be considered as a big achievement to the governorate within a record time of a few years. The development projects are continuous in the fields of the company and it is expected to finish the third treatment station in Halfaya field within the end of this year with capacity of (200) thousand barrels/ day to elevate the production from the field to (400) thousand barrels, and elevate the production of the company. The representative of the Chinese company Inpal said that the project was executed according to the international standards within 18 months and will ensure the investment of large gas quantities to be used in the power station turbines in the field and the national power network. Posted in Bazargan, Bazergan, China, featured, gas production, HaLFAYA, Inpal, Iraq Oil & Gas News, Maysan, Missan. The Iraqi Ministry of Oil (MoO) announced on 4th January 2018 that it had obliged Missan International Refinery Company (MIRC) (actually the bankrupt Swiss company Satarem) to sign an undertaking that it should start working on the 150kbd Missan Refinery within 30 days; otherwise the contract will be terminated without having any legal and financial consequences on the Ministry. This move by the Ministry is long overdue and should be the very final termination warning as more than four years were lost without any tangible progress in the construction of the refinery. As I have repeatedly argued, through my writings especially the direct debate communications with the Ministry officials and advisors that by concluding such a dubious contract with highly questionable unqualified bankrupt company, the Ministry surely deters serious refinery investors and, thus, defeats its own aspirations. Posted in Ahmed Mousa Jiyad, bank, Banking & Finance, Business, Corrruption, featured, Iraq Oil & Gas News, Maysan, Missan, Missan International Refinery Company (MIRC), Missan refinery, Satarem, Switzerland. 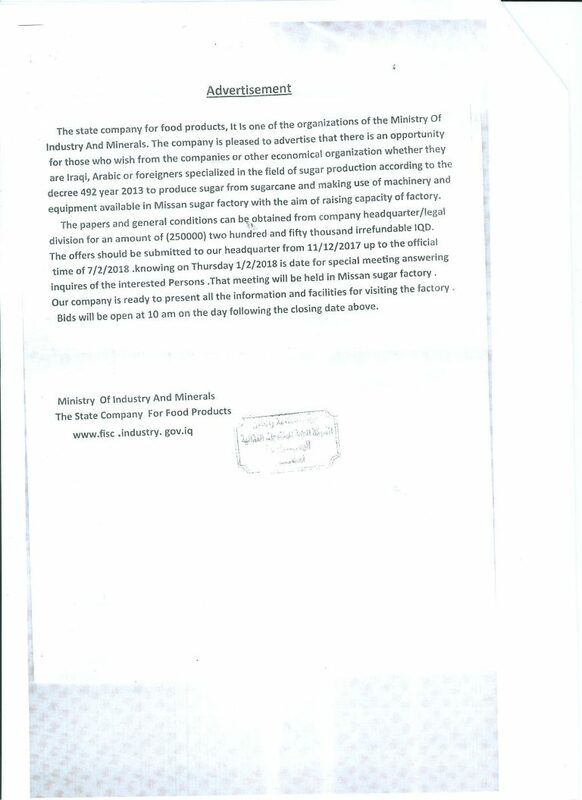 The State Company for Food Products, part of the Ministry of Industry and Minerals, has announced an opportunity to invest in sugar production in Missan province. Posted in Agriculture, Business, Commission, featured, Investment, Investment Opportunities, Iraq Industry & Trade News, Maysan, Missan, National Investment Commission (NIC), State Company for Food Products, Sugar, Tenders. Baker Hughes, a GE company, has signed an agreement for the provision of turbine generators to PetroChina International Iraq, in the biggest Turbomachinery & Process Solutions (TPS) agreement ever between the two companies. BHGE will deliver its Frame 6B gas turbine electric generator trains to support power generation for the Halfaya oilfield located in the Maysan Governorate. The equipment will generate 150 MW of power for the project and leverage support from BHGE’s existing local and global workforce. The components of the turbo generator units will be manufactured and assembled at BHGE’s Nuovo Pignone facility in Florence, Italy. “This deal strengthens our local footprint in Iraq and further demonstrates our dedication to the region where we see great promise and have formed strong partnerships through ongoing projects and the development of local skills. BHGE’s Frame 6 turbines are able to operate in extreme conditions and harsh environments across a wide range of applications, and have been proven and tested with more than 55 million operating hours. The turbines are designed to be fully fuel flexible, possessing the ability to run on a wide range of gas or distillate liquids, including sour gas. This offers valuable cost saving to customers, as the turbines can run on the most economically available fuel for a given operation. In addition to the Halfaya contract, the turbines have been used in multiple projects in the region. The Halfaya oilfield was discovered in 1976 with 4.1 billion barrels in reserves and is situated in the southern part of Iraq in the country’s Maysan Governate. The field, operated by PetroChina International Iraq, currently produces approx. 200,000 barrels per day. This agreement with PetroChina International Iraq further strengthens BHGE’s presence in the country, where it has contributed to several projects, including power generation support for two of Iraq’s largest fields – West Qurna and Rumaila – and retains a local footprint consisting of over 70% Iraqi employees. BHGE also owns and operates a technical services facility in North Rumaila, which opened in 2013 and was expanded this summer. The facility offers a wide range of testing, repair and refurbishment services and has helped to create local employment opportunities and training for more than 2,000 Iraqi professionals. Posted in Baker Hughes, Business, China, Electricity In Iraq, featured, GE, HaLFAYA, Iraq Oil & Gas News, Italy, Maysan, Missan, PetroChina, United States. The Ministry of Oil announced on Sunday that it has started drilling the first well in the Huwaiza [Huweiza] oil field near the Iranian border, in Maysan [Missan] governorate. The field is being developed by Missan Oil Company (MOC), with drilling being carried out by the Iraqi Drilling Company (IDC). Geological studies and preliminary forecasts indicate reserves of more than one billion barrels of oil at the field. Posted in drilling, featured, Iraq Oil & Gas News, Iraqi Drilling Company (IDC), Maysan, Maysan Oil Company (MOC), Missan, Missan Oil Company (MOC). Posted in Commission, Construction & Engineering In Iraq, featured, Housing, Maysan, Missan, National Investment Commission (NIC). More than 10,000 volunteers have participated in “Clean Missan in One Day” Campaign. Volunteers were university and high school students, NGOs, community leaders and members of Missan local Government. Around 500 tons of waste have been collected, 800 trash containers distributed and 4,000 meters of sewages have been completely cleaned. Songs and theatre performed by kindergarten children marked the start of the campaign launched on 22 December 2016 by Local Area Development Programme (LADP), funded by the European Union (EU) and implemented by UNDP. Artists and painters who volunteered for the campaign painted the outside walls of seven schools and a health clinic, and more than 2,000 m of sidewalks of main streets. The volunteers also planted 1,500 trees along the main streets of Hay Al-Askry district. The “Clean Missan in One Day” Campaign included 9 awareness-raising lectures held in one week at schools, mosques, community and youth sport centers in Missan in cooperation with the Department of Environment and Health of Missan Governorate. Posted in Abbas, Citi, Citigroup, European Union, featured, Iraq Public Works News, Maysan, Missan, sanitation, UN Development Programme (UNDP). The Maysan Oil Company (MOC) wants to develop the Howaiza oil field, an associated field located on the Iranian border and extending to 63 kilometers to the east of Maysan governorate. Mr. Adnan N. Sajit, the director general of the MOC, said the first well was drilled at the Howaiza field at the end of the 1970s, but the development was halted because of the Iran-Iraq war. He added that reservoir studies show an oil storage estimated with 854 million barrels, and oil reserves estimated at 219 million barrels, which qualifies the field to produce 20-to-30 thousand barrels/day (bpd) after the completion of the development. He said also that the development plan will start in 2017 “by depending on the national efforts“. Posted in featured, Howaiza oil field, Iran, Iran-Iraq War, Iraq Oil & Gas News, Maysan, Maysan Oil Company (MOC), Missan, Missan Oil Company (MOC).